From the same collection as the other portraits shown, this one is labelled up as "Unbekannter offizier" or unknown officer. I think he is an infantry officer but I invite your speculation in the comments section below. 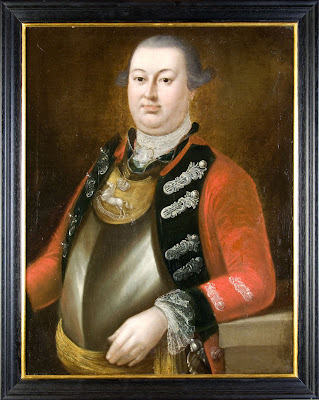 This one, and the previous one in 'Portraits of Hanoverian SYW Officers (2)' were painted in 1748/9 so while strictly speaking they predate the war by a few years they are close enough to be considered contemporary. I note that (like the last painting) he is wearing a cuirass. And a sudden thought . . . while most of Hanover's mounted were in white coats, their Horse Grenadiers were in red (with black facings at least part of the time). They were formed in 1742, so this fellow could be a horse grenadier rather than an infantry officer. And the previous officer might be as well (although his facings appear to be gold to me).